Using the data they extracted from Mr. Silver’s network using the cyber-weapon procured at the Galactic Governance Conference crew of the UAS Helix discovered the location of a secret facility that seemed incredibly important. They met up with the Red Suns and a Federation fleet at the location and boarded the small space station. Inside, they found a small tram leading into a miniature warp gate. With only enough room in the tram for five, the crew of the Helix headed in alone, unsure of what to expect on the other side. Inside, they learned that terrible experiments had been conducted to combine Humans and Pokemon into a being of terrible power and malice; the first of the next generation. The abomination pursued the crew across the station, and would have killed them had they not escaped through the warp gate aboard the tram. They destroyed the gate, but it was all for naught as the powerful creature followed them by warping in freely at an alarming speed. The UAS Helix barely managed to escape into deep warp space while the abomination destroyed the Federation fleet. The Helix drifts ever deeper into the Void of the Warp as Shane guides the ship along toward its destination. The hypnotizing swirls of deep warp energy only serve to exacerbate the unsettling atmosphere permeating through the ship. While the events of the past few days have been troubling for most of the crew, for Alex in particular, they have been quite traumatizing. The encounter with the abomination created by Mr. Silver’s scientists has left her shaken. She sits alone in her room attempting to craft new and improved cases for her Pokeballs, but her hands are trembling too much to even hold her tools. In stressful situations she had always found solace in working on Pokeballs, but today she finds no such comfort. “Aagh!” she cries out in frustration and distress as she bashes her hands against her desk, once again having dropped her screwdriver. She throws it at the wall in frustration, then storms out of the room. I just need it to stop, she thinks as she makes her way to the med bay. Alex enters the room and slips past MARIA who is currently tending to Dmitri’s injuries. She heads for the medicine cabinet and begins rummaging through it. There’s gotta be something here. Alex pulls out several bottles, but finds she has no idea what any of the words on their labels mean. She doesn’t know if they will help or only make things worse. The girl sets the bottles down on the counter and resumes her search. Alex sputters out some sort of explanation, but Morgan can hardly tell what she’s saying. All she manages to understand is something about shaking hands and a headache. From the look on the girl’s face, Morgan gets the sense that she’s on the verge of tears. “Just relax,” Morgan tells Alex, taking on a calmer tone. “I’ll help you out, but first we need to put these things back. You can’t just take things, especially medicine, when you don’t know what they are.” She moves Alex back from the counter and begins collecting the bottles that the girl had pulled out and checking their labels. Once the counter is cleaned up, Morgan grabs the bottle in Alex’s hand and reads the label. To her surprise, it appears to be some sort of aphrodisiac. How the hell did this get in here? Morgan thinks to herself. Probably H… She sighs and shakes her head, then sticks the bottle in the very back of the cabinet. “Alex needs to relax,” Morgan explains, gently leading the other girl in front of her. She doesn’t want to worry Alex, so she silently communicates the gravity of the situation to MARIA through her datajack. Please, please, just keep her sedated for the next few hours. MARIA takes some pill bottles from the cabinet and presses several tablets into Alex’s shaking hands. Thankfully, despite her trembling, Alex is able to swallow them without too much trouble. “Why don’t you go back to your room?” Morgan suggests. “We’ll be out of here soon, I promise.” Morgan sees Alex back to her room, then leaves the girl to her business once she’s sure she’s okay. As the pills start to take effect, Alex feels the trembling subside and she once again returns to working on her Pokeballs. However, once the medication takes full effect, the girl starts feeling rather drowsy and eventually drifts off to sleep. As the Helix travels deeper into the Void, the crew packs it in and prepares to deal with the possibility of warp madness. With Shane helming the ship on its warp voyage, Minerva returns to her room and settles into her sleeping pod. Armstrong, on the other hand, seeks the comfort of a bottle of whisky in his personal quarters. H, meanwhile, lies unconscious on the floor of his lab, having neglected to seek medical attention after the crew’s encounter with the abomination in Mr. Silver’s hidden facility. He once again dreams of the majestic space Wailords, although fully aware of his unconscious state. H sails across the warp currents on a back of one of these Pokemon until he finds himself back aboard the Helix. Now fully awake, but still perceiving reality as a dream, H leaps up from the floor and takes in his surroundings. He locks eyes with Dmitri, who had just walked into the room. “Aha!” H shouts to his Romanov crewmate. “Wonderful! To arms, my brother! We have great work to do! Away!” The delusional cyborg leaps up and attempts to bust through the ceiling, only to bash his head and fall back to the floor. H jumps back to his feet and hurriedly exits the room. “I must be free!” he shouts. “I must rejoin them! They need my presence! We must save them from the devastation!” He makes his way to the bridge where he finds Shane steering the ship with his marked hand. Hearing a noise behind him, Shane turns his head back and spots H stepping onto the bridge. “Hey, H,” he addresses his crewmate calmly. “You have stood in my way for the last time!” H shouts in response. “Release me from this prison!” The crazed cyborg leaps forward at Shane and tackles him to the floor. The Helix shakes violently as the ship is flung out of control into the Warp. “Ha! Take this!” H shouts. “Belly-pogo augment Number D!” His belly-pogo flings out of his chest compartment with a boxing glove and clocks Shane in the face. Dmitri, who had been following H, runs onto the bridge, and attempts to subdue H with his psionic abilities. However, the Romanov fails to stop him. H leaps back up, grabs Shane, and tosses him across the bridge. Shane quickly teleports himself behind his assailant to avoid crashing into anything. “Where are you? !” H shouts in response. “Your silly mental tricks will not subdue me!” H turns to see Shane swing at him, his marked arm glowing a shocking shade of purple. Shane strikes H full force and sends him flying across the bridge. Drawn by the Helix’s lurching, Morgan runs onto the bridge to see H slam into the wall, and fall back into unconsciousness. “What the hell is going on here?” she asks. “H needs to be contained,” Shane tells her calmly, wiping a small trickle of blood from his lip. He then turns back to the main console and steers the ship back on course. “Alright,” Morgan responds. She and Dmitri grab H by the legs and drag him off to the med bay for medical treatment. Before doing anything, the two of them make sure to restrain him, then Morgan gives MARIA strict orders to keep an eye on the cyborg. Eventually, the Helix arrives at the heart of the Void; a location that some of the crew had been once before. Recognizing the threat facing the Galaxy, Shane had brought the ship back here in hopes of making contact with Giratina once more. Alex awakens in her room and stumbles to the viewport, still experiencing the effects of the sedatives Morgan had given her. She stares out into the Void and sees the face of a massive serpentine Pokemon wrapped around the ship. The devilish face of the creature would have been quite unsettling to the girl had she not been drugged up. “Woah…” is all she can say in awe of this Pokemon. Having finished up in the med bay, Morgan decides to check up on Alex. She enters the girl’s room and sees her staring out the window at Giratina. Remembering her previous experience with this Pokemon, Morgan quickly rushes to Alex and pulls her away from the viewport. “Come on, you shouldn’t stare out into warp space like that,” Morgan tells her, recalling what happened to Arlon the last time they were here. “But there’s a thing,” Alex protests, sounding rather loopy due to a blend of the sedatives and the early onset of warp madness. “I want to look at the thing.” Alex tries to resist Morgan, but does little more than squirm. Giratina turns its head away and looks off toward another part of the ship. Morgan leads the girl outside the room and sits her down in the hallway. “Just stay here,” Morgan tells her. “I’ll be back as soon as I can.” She then runs off toward the bridge to speak with Shane. As she makes her way down the hallway, Morgan sees Shane walk into the airlock and seal the door behind him. Morgan quickly runs to the door, where she sees Shane place his hand on the exterior airlock button, contemplating opening it. “Shane, what the hell are you doing? !” she shouts over the comms. “There are a few things that I don’t remember,” Shane continues. “And one of them is creating this thing.” He points to the massive Pokemon flying around the outside of the Helix. “But what are you doing?” Morgan asks him. “You know, when you put it that way, I don’t really know,” Shane tells her. He opens the airlock and lets himself fall, directly at Giratina. The Pokemon flies past him and he turns to see it sitting in the airlock, despite it being far larger than the airlock itself. Shane quickly teleports himself back into the airlock and shuts the door. Unfazed, Giratina warps itself onto the other side of the door. Shane just opens the door and follows it out. As the Pokemon flies into the ship, it seems to warp the very space around it. Alex looks down the hallway and sees Giratina a very long distance away, longer than the hallway itself. Fascinated, Alex stands up and begins running toward it. “Alex, don’t come over here!” Morgan shouts at her, but the words don’t seem to reach her as she remains fixated on the spatial distortions. Alex can’t seem to wrap her head around them. Dmitri also begins stepping toward the Pokemon from the other direction, having just come around the corner. He finds himself across the space in an instant. Unlike Alex, Dmitri remains focused and realizes that Giratina is distorting space with its presence and tries to block that from his mind to keep himself sane. Shane pokes Giratina with his branded hand and immediately captures the Pokemon’s attention. Giratina looks intently at Shane’s mark with a look of what he perceives to be confusion. It doesn’t seem to remember Shane, or the brand it had given him. Shane comes to the realization that the Pokemon doesn’t seem to have a concept of object permanence. Shane creates a small ball of warp with his hand, and Giratina flies into the palm of his hand. Just looking at this is odd for Shane, as the Pokemon is still much bigger than him. As for the others, their brains are completely befuddled. Shane slams an Ultra Ball into his hand, but it just phases inside of Giratina. Realizing that he has no real way of catching this Pokemon, Shane retracts his hand, pulling the ball back out. Giratina then turns away and starts flying down the hallway. Alex sees the Pokemon flying directly at her and grabs onto one of the spikes protruding from its side. She swings herself up onto Giratina’s back as it continues to fly down the corridor. The hallways and elevator shafts seem to bend into a straight line as it moves toward the ship’s warp drive. The others quickly run after Giratina, however, the hallway warps around them, leaving each of them stranded on a twisted and distorted path of walls, floors, and ceilings. Shane quickly kicks himself off the walls and keeps moving while Morgan and Dmitri take more time to wrap their minds around the situation. Meanwhile, Giratina continues on toward the warp drive, and flies straight into the exposed warp reaction. Alex remains on the Pokemon’s back, gripping it tightly, too frightened to even let go. She cries out in pain as the warp field envelops her. “Alex!” Shane shouts as he runs into the room. He quickly uses his power to swap his position with the girl, safely pulling her out of the Warp and leaving himself riding on the back of Giratina. The space around Shane begins to warp and distort at an increasing rate and he becomes aware of what the Warp actually is. It is Giratina, and Giratina is Space itself. He realizes that Giratina is the sole reason that all warp technology works; why Space works. Shane places his marked hand on top of Giratina’s head and it sparks some kind of reaction. He can feel even more power flowing through him. He kicks himself off of Giratina and launches himself back onto the floor, outside of the Warp reaction. “Well, that wasn’t quite what I was expecting, but thanks, Giratina,” he says aloud. The ship, for the most part, has returned to some semblance of euclidean normality. Shane then turns, takes two steps, and arrives back on the bridge. Shane places his hand back on the console, and begins affecting the Warp around the Helix. The ship begins rapidly ascending through the layers of warp space and emerges right on the surface of the planet Vandia. The Helix tears across the very same cabbage field it crashed in two months ago, and grinds to a halt. Session Notes: Talk about mindfuckery. The laws of Space don’t apply in the Void. Especially not with Giratina, which apparently has an almost infantile mind. For those who don’t know, Object permanence is the notion that once an object has left one’s field of vision, it still exists despite not being visible, a notion that seems to be lost on Giratina since it doesn’t remember branding Shane around thirty chapters ago (holy crap that still feels like yesterday). It was a pretty cool revelation that Giratina is the force of Space and the Warp itself (which apparently means we won’t be seeing Palkia at all in this story). We also learned that the laws of Space are more like guidelines than anything. This half of the session was mostly fun RP stuff. No combat or anything. The funniest part is when DragonStorm rolled a d100 to determine what random bottle Alex pulled out of the cabinet and got a 69, which is why it ended up being an aphrodisiac. Gotta love dice rolls. So yeah, Shane got more fun warpy powers! Hopefully they will help us against the Mewtwos! And now we’re back on Vandia, because why not? 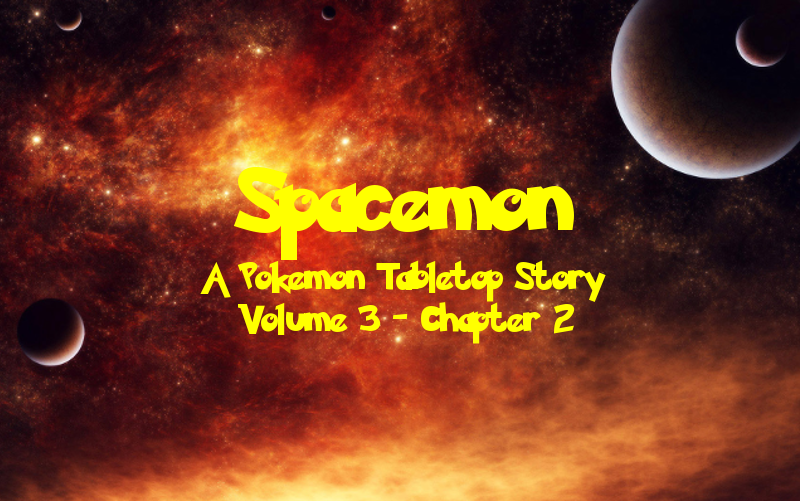 Also, just a heads up, but be sure to read the Spacemon mini-series Tempore Ex Machina, written by DragonStorm, before you read the next chapter of Volume 3, which covers the second half of this session. You can find the three parts here, here, and here. And, if you haven’t yet, be sure to check out the first installment of my Red Suns mini-series starring my former character, Arlon Jett!